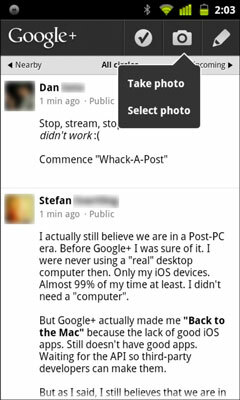 There are multiple ways to upload photos using the Android and iOS apps for Google+. At this time, however, you cannot upload photos on other mobile web browsers. On Android devices, you can share your photos straight from the photo app on your phone. On both iOS and Android types of devices, you can also attach a photo to a status update. If you tap the little camera or photo icon in the Android widget, it will take you straight to either the camera view or to pick from your photo albums on your phone, respectively. This can be a quick way to share to Google+ in as few steps as possible. Open the Google+ app on your phone and tap the Photos icon on the splash page that appears. Choose one of two options to select a photo to share. Choose Take Photo to take a photo from your camera or choose Select Photo to select one from your phone’s albums. If you chose Select Photo, a screen will appear with your phone’s photo albums. Check the box next to all the photos you want to share and select Share. If you chose Take Photo, a camera view for your phone will appear. Just take your picture. On iOS devices, the Take Photo and Select Photo buttons are two separate buttons, very similar to the buttons in the Android widget. To take a photo, tap the camera button. To select a photo, tap the button next to it that looks like two photographs stacked on top of each other. Type a message to go with your photos. Select the circles you want to share to. Select a location (if you choose). Tap Post to post your photos.